I have decided to jazz up the player spotlights a bit by adding a post for each player who earns the honor each week. This week Todd "Fridge" Fedoruk has earned his place in the spotlight. Why? On any given day Fridge can be found joking around with teammates or high fiving them as they head back out onto the ice after a game intermission. He isn't afraid to hit, fight, dig, whatever is nessecary to give his team the edge. He provides his teammates with everything from comic relief to major morale boosts. He provides the fans with great hits and hard work. He's even contributed some goals so far this season. Todd Fedoruk was drafted 164th overall by the Philadelphia Flyers in the 1997 entry draft. Fedoruk stayed with the Flyers organization for seven seasons after being drafted. 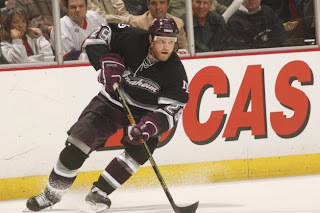 On July 29, 2005 he was traded to the Anaheim Ducks for a 2005 second round draft pick (that turned into Pierre -Olivier Pelletier). 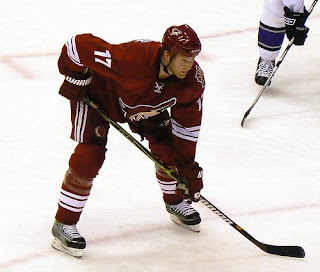 During the 2006-2007 season while playing with the Ducks , Fedoruk achieved career highs in games played (76), assists (19), points (23) and penalty minutes (174). 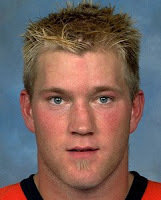 The Flyers re-acquired Fedoruk on November 13, 2006 for a fourth round draft pick. Fedoruk, who is known for his skills as an enforcer, had titanium plates permanently embedded into his face to repair injuries caused to him in a fight with Minnesota Wild enforcer Derek Boogard during the 2006-2007 season. 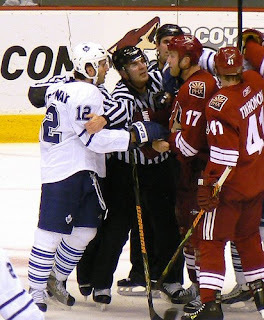 Later in the season, on March 21, 2007, Fedoruk was once again injured in a fight against New York Rangers enforcer, Colton Orr. Fedoruk was knocked unconscious and had to be carried off the ice on a stretcher. *Many thanks to BleadinTealinAZ for the fantastic Coyotes Fedoruk photos. "Fedoruk has made it very clear from the beginning of his stint with the Coyotes, that he considers the team a part of his family. He had an interview during summer camp that explained how he felt about defending his teammates and helping them feel better on the ice and play better. During the break between periods in the start games, you could see him waiting before the locker room, high fiving all the guys as they come off the ice. It is a nice thing to see, and it helps build the team up and in turn they play better. GO FRIDGE!!" "When I first saw Todd Fedoruk in a Coyotes’ jersey, I thought “that’s just what we need, another bruiser….” Who would have thought that he would be such an asset to the team? He encourages the team, produced a “fluky” goal, and even provides comic relief when he does such things as leaving he false teeth on the shuttle." "He's not afraid to get into the corners and dig to get in there to move the puck. However, I was expecting to see a lot more of the enforcer in him than we have, and would like to see more hip checks out of him. I believe those have a tendency to spark the team and the crowd. I do love his smile (without the bridge). It reminds me of Bobby Clarke old school hockey." "My Todd Fedoruk Fantasy: Kickboxing class at the Y followed by showers (separate- you dirty, dirty readers), then some sort of appetizer with alcohol at a local restaurant. There we talk about which cities he's enjoyed the most and what he wants to do after hockey. We end the night with a dap and then a hug. Its the perfect evening of aggression, appetizers and banter. I like that Todd is the type of guy that could show up to a party without his teeth and still rock it out. He understands that hockey is a business. After seeing him in this video (preseason video from phoenixcoyotes.com), I respected him. A lot." "Todd Fedoruk. Tough left wing that gets some ice time to get the big lines much needed breathers. Actually He could be on a line with a couple of the young guns for protection. One word that best describes the left winger GRITTY"
"What can I say about Fridge? Most Coyotes fans were not excited when we found out that we had signed Fridge. We had all seen him in action against us (while with the Stars and Wild) and didn’t think he would be that great for our team. Boy were we wrong. He showed up early for the unofficial practices at the Alltel Ice Den. That started to win us over. Then we noticed, he isn’t as bad a skater like we had thought. The more we have seen of him over the season the more he has shown us exactly what kind of guy he is, a team player. He is there for his teammates no matter what. He stands inside the tunnel and says something to each guy as they go past him. We have also noticed he will fight anyone (although he may not be the best fighter) that messes with his teammates. He is not afraid to hit or be hit to make a play. He will hit anything in an opposing team jersey; he doesn’t discriminate. He may not be an offensive threat (3G and 2A) but he brings so much more to the team. He is the type of guy you want around because he is tough, he works hard, and he is a true team player. And on a side note: We love you Fridge, but please, please, please put your teeth in when you are interviewed!" We love you Fridgy & appreciate all that you do for this team. We hope you stay in the desert for a long, long time. *Coyotes team photo pic can be found on Fridgy's Coyotes page. *All other Fridgy photos found via google search.